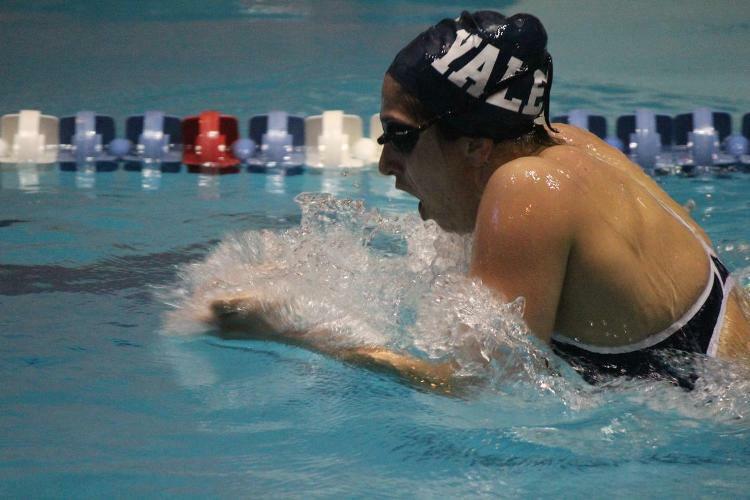 The Yale women attacked early, taking first and second place in the 200 medley relay. The Bulldog A squad of Jacquelyn Du, Paulina Kaminski, Maddy Zimmerman and Kina Zhou led the way with 2:03.09, with their B squad just behind them at 2:03.60. Yale also closed the meet with a 1:48.26 win in the 200 freestyle relay on a combined effort from Kina Zhou, Cassidy Richards, Amy Zhou and Bella Hindley. The Bulldogs also racked up points with three double event winners. 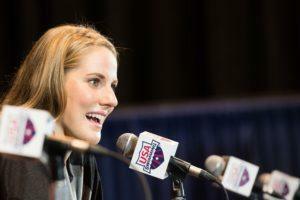 Eva Fabian took both the 800 and 400 meter freestyles in times of 9:12.81 and 4:31.32. In the 800 she led a 1-3 Bulldog sweep, followed by teammates Cailley Silbert (9:13.04) and Casey Lincoln (9:24.53.) Silbert also finished second behind Fabian in the 400 free at 4:32.17. Bella Hindley took both sprint events for the Bulldogs, finishing the 50 free in 26.96 and the 100 free in 58.70. Yale’s other double event winner was Lilybet MacRae who led 1-3 sweeps in both the 1-meter and 3-meter diving events. Cornell won three individual events, with Hannah Bollinger’s 2:09.64 for the 200 free, Jordan Silbert’s 5:09.49 400 IM, and Helen Hsu’s 1:08.10 for the 100 back. The back was a 1-2 finish for the Big Red women, with teammate Tessa Wilson finishing runner-up at 1:09.18. The Cornell men won both relays and four individual events, but added up to a score just shy of taking down the Bulldogs. The Cornell A-squad of Dylan Sali, Victor Luo, Luke Reisch and Jack Brenneman easily took the 200 medley relay in 1:45.71. The 200 free relay to close the meet was much closer, with Taylor Adams, Brenneman, Sali and Reisch barely holding off Yale 1:36.11 to 1:36.13. Yale answered quickly after the first relay loss with a 1-2 finish in the first two individual events. Kei Hyogo (8:27.97) and Ben Lerude (8:37.50) owned the 800 meter freestyle, while Scott Bole (1:56.86) and Brian Hogan (1:57.95) did the same in the 200 free. Hyogo went on to take two more individual events later in the meet with his 4:31.45 for the 400 IM and 4:04.99 400 freestyle. Cornell responded with a 1-2 finish for the 50 free with Jack Brenneman and Taylor Adams taking the event in 24.09 and 24.32 respectively. Yale replied with a 1-2 sweep of the 100 freestyle on a 52.96 from Victor Zhang and 53.17 from Josh Ginsborg. Cornell also had wins from Luke Reisch in the 100 fly (56.72,) Dylan Sali in the 100 back (59.84,) and Noah Sterling in 1-meter diving (264.90.) Yale’s Derek Kao won the 100 breast in 1:05.98 and Wayne Zhang took 3-meter diving with 286.95.